Earth has warmed by about 1ºF over the past 100 years. But why? And how? Well, scientist are not exactly sure. The Earth could be getting warmer on its own, but many of the world’s leading climate scientists think that things people do are contributing to make the Earth warmer….. Global warming is a term used to describe a gradual increase in the earth’s average ground and atmospheric temperatures across the whole planet. Measurements indicate that the global temperature has increased by about 1 degree Fahrenheit in the past century. A warmer Earth may lead to changes in rainfall patterns, a rise in sea level, and a wide range of impacts on plants, wildlife, and humans. When scientists talk about the issue of climate change, their concern is about global warming caused by human activities……. The Earth is wrapped in a blanket of air called the 'atmosphere', which is made up of several layers of gases. The sun is much hotter than the Earth and it gives off rays of heat (radiation) that travel through the atmosphere and reach the Earth. The rays of the sun warm the Earth, and heat from the Earth then travels back into the atmosphere. The gases in the atmosphere stop some of the heat from escaping into space. These gases are called greenhouse gases and the natural process between the sun, the atmosphere and the Earth is called the 'Greenhouse Effect', because it works the same way as a greenhouse. The windows of a greenhouse play the same role as the gases in the atmosphere, keeping some of the heat inside the greenhouse. The Earth’s atmosphere is all around us. It is the air that we breathe. Greenhouse gases in the atmosphere behave much like the glass panes in a greenhouse. 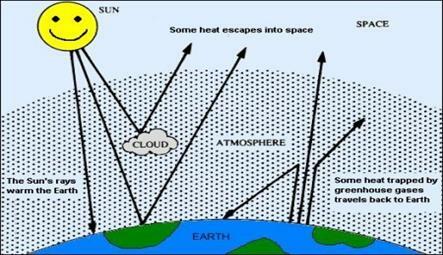 Sunlight enters the Earth's atmosphere, passing through the blanket of greenhouse gases. As it reaches the Earth's surface, land, water, and biosphere absorb the sunlight’s energy. Once absorbed, this energy is sent back into the atmosphere. Some of the energy passes back into space, but much of it remains trapped in the atmosphere by the greenhouse gases, causing our world to heat up. To make sure that the Earth's temperature remains constant, the balance of these gases in the atmosphere must not be upset. Once, all climate changes used to occur naturally. However, during the Industrial Revolution, we began altering our climate and environment through agricultural and industrial practices. The Industrial Revolution was a time when people began using machines to make life easier. It started more than 200 years ago and changed the way humans live. Before the Industrial Revolution, human activity released very few gases into the atmosphere, but now through population growth, fossil fuel burning, and deforestation, we are affecting the mixture of gases in the atmosphere. A group of greenhouse gases called the chlorofluorocarbons’, which are also called CFC’s have been used in aerosols, such as hairspray cans, fridges and in making foam plastics are dangerous greenhouse gases because small amounts can trap large amounts of heat. When Do You Send Greenhouse Gases into the Air? ... you are adding to send greenhouse gas into the air which impacts the environment negatively. Average global temperature has increased by almost 1ºF over the past century; scientists expect the average global temperature to increase an additional 2 to 6ºF over the next one hundred years. This may not sound like much, but it could change the Earth's climate as never before. Even a small increase in temperature over a long time can change the climate. When the climate changes, there may be big changes in the things that people depend on. These things include the level of the oceans and the places where we plant crops. They also include the air we breathe and the water we drink. Human Health : Climate change may affect people's health both directly and indirectly. For example, heat stress and other heat related health problems are caused directly by very warm temperatures and high humidity. Untreated, heat stress can be a very serious medical problem. Indirectly, ecological disturbances, air pollution, changes in food and water supplies, and coastal flooding are all examples of possible impacts that might affect human health. The Weather: Scientists suspect that, in many places, climate change will increase the number of very hot days that occur during the year. In different parts of the world, the effects will be different, some places will become drier and others will be wetter. Although most areas will be warmer, some areas will become cooler. There may be many storms, floods and drought, but we do not know which areas of the world will be affected. All over the world, these weather changes will affect the kind of crop that can be grown. Ecological Systems: Climate change may alter the world's habitats and ecosystems – all living things are included in and rely on these places. Many of these places depend on a delicate balance of rainfall, temperature, and soil type. A rapid change in climate could upset this balance and seriously endanger many living things. Most past climate changes occurred slowly, allowing plants and animals to adapt to the new environment or move somewhere else. However, if future climate changes occur as rapidly as some scientists predict, plants and animals may not be able to react quickly enough to survive. Sea Level Rise: Global warming may make the sea level become higher. Why? Well, warmer weather makes glaciers melt. A glacier is a large sheet of ice that moves very, very slowly. Some melting glaciers add more water to the ocean. Warmer temperatures also make water expand. When water expands in the ocean, it takes up more space and the level of the sea rises. Sea level may rise between several inches and as much as 3 feet during the next century. This will affect both natural systems and manmade structures along coastlines. Coastal flooding could cause saltwater to flow into areas where salt is harmful, threatening plants and animals in those areas. Oceanfront property would be affected by flooding, and beach erosion could leave structures even more vulnerable to storm waves. Crops and Food Supply: The changes in the weather will affect the types of crops grown in different parts of the world. Some crops, such as wheat and rice grow better in higher temperatures, but other plants, such as maize and sugarcane do not. Changes in the amount of rainfall will also affect how many plants grow. Change also might bring droughts to other places where we grow crops. IN DANGER! Plants & Animals: It has taken million of years for life to become used to the conditions on Earth. As weather and temperature changes, the homes of plants and animals will be affected all over the world. For example, polar bears and seals will have to find new land for hunting and living, if the ice in the Arctic melts. Many animals and plants may not be able to cope with these changes and could die. This could cause the loss of some animal and plant species in certain areas of the world or everywhere on Earth. Climate change may be a big problem, but there are many little things we can do to make a difference. If we try, most of us can do our part to reduce the amount of greenhouse gases that we put into the atmosphere. Many greenhouse gases come from things we do every day. Driving a car or using electricity is not wrong. We just have to be smart about it. Some people use less energy by carpooling. For example, four people can ride together in one car instead of driving four different cars to work. Here are some additional ways you can help make the planet a better place! Read: Learning about the environment is very important. There are many good books that will help you learn. To get started, ask our CSR team or a librarian for some suggested books / articles. You also can look at the Links page to find other good web sites with information about the environment and climate change. Save Electricity: Whenever we use electricity, we contribute in putting greenhouse gases into the air. By turning off lights, the television, and the computer when you are through with them, you can help a lot. Using public transport or Walk: You can save energy by sometimes taking a public transport like train or bus, or walking. Talk to Your Family and Friends: Talk with your family and friends about climate change. Let them also know what you've learned. Plant Trees: Planting trees is fun and a great way to reduce greenhouse gases. Trees absorb carbon dioxide, a greenhouse gas, from the air. Recycle: Recycle cans, bottles, plastic bags, and newspapers. When you recycle, you send less trash to the landfill and you help save natural resources, like trees, oil, and elements such as aluminum. When You Buy, Buy Cool Stuff: Buy products that don't use as much energy. By conserving energy, we help reduce climate change and make the Earth a better place. Some products – like certain cars and stereos – are made specially to save energy. Buy recyclable products instead of non-recyclable ones. Look for the recycle mark – three arrows that make a circle – on the package. Recyclable products are usually made out of things that already have been used. It usually takes less energy to make recycled products than to make new ones. The less energy we use, the better. Solar Energy: Solar energy is a fancy way of saying "energy that comes from the sun." Solar energy can be used to heat homes, buildings, water, and to make electricity. Today, more than 200,000 houses in the United States take advantage of the sun's energy. ENERGY STAR®: Many things, like computers, TVs, stereos, and DVD players, refrigerators have special labels on them. The label says "Energy" and has a picture of a star. Products with the ENERGY STAR® label are made to save energy. Buying products with ENERGY STAR® labels will help protect the environment. So….Think Green and help save environment…….